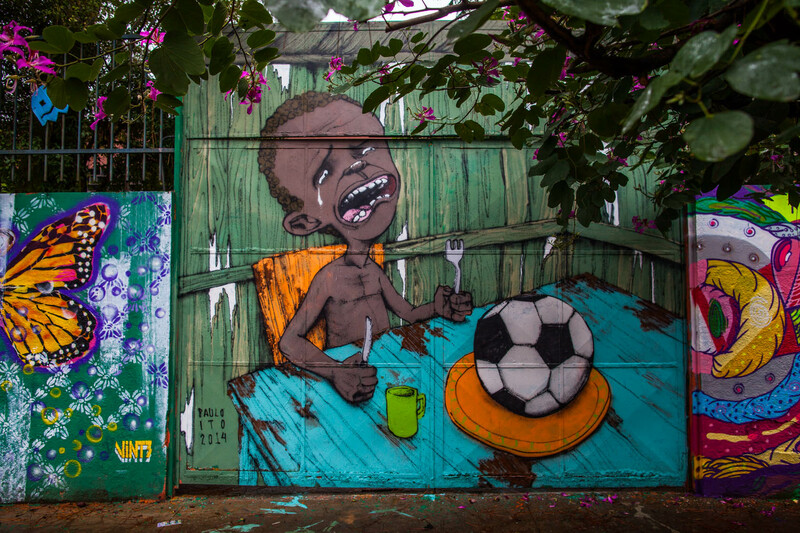 The World Cup Kicks Off in Sao Paulo, But What Do Brazilians Think About 2014's Controversial Games? It's finally here. It's time to end the will they be ready? drama, because, now, they have no choice but to be ready. The night the world has been preparing for has arrived — Thursday marks the opening games of the 2014 World Cup in São Paulo, Brazil. It's no secret that Brazil — a country with five wins, the most of any nation — takes football (a.k.a. soccer) very seriously. And here's guessing the country is not hoping for a repeat of 1950, the year Brazil first and last hosted the World Cup. Known as The Maracanã Blow, Brazil lost to Uruguay 2-1 during the last portion of the final game in Rio de Janeiro, halting the 200,000 person stadium to a complete silence. The crushing defeat has haunted them since and many are hoping to redeem themselves with this year's games. I am fortunate enough to possibly see this redemption in São Paulo this year — after visiting Brazil last year to do preliminary research for my graduate thesis, I'm back to finish and learn Portuguese. Good timing is an understatement. The games start in a few hours, yet I can already hear the excitement on the streets — cars honking, vuvuzelas blaring, people on the streets drinking and cheering. It's hard not to get caught up in all of the fervor, despite the controversy of alleged corruption and unjustified spending that has led to protests, so I decided to ask a few locals what they thought about Brazil hosting the World Cup. What they had to say may surprise you. "It’s very complicated. I think it’s better if Brazil doesn’t win. Winning might be good for the politicians so they can hide our problems with a win. [But] it’s better if Brazil doesn’t win because then I have to ask the government, 'What is going on in this country?' These football games are not what we need in this country ... However, we need something to join the people together. And maybe that is football. Once we are all together we can seek for the next level." "The country is not prepared for this. Period. It’s not prepared politically, socially, culturally, it’s not ready to receive the World Cup. I adore football, I adore Brazil. There is a time for everything, but now is not the time for this." "Having the Cup now is not the right time. It could have been so great at another time. Right now it’s way outside of our reality. There are people that live in protest, they need other things beside the Cup, things like health, education, things that have a profound effect on the day-to-day life of Brazilians." "I am Brazilian. I like the quality of football from Brazil ... The players now need to have endurance, they need the passion and will to overcome any obstacle and win. I’m wondering if they will have this endurance and needed patriotism, things that Argentina, U.S have. They have these things. [Our players] need to represent us well." "It’s a bit complex. On one side, it’s good. But on the other side, it’s not the right time for us to do this. We have other priorities. From one side comes the money from the tourists, that’s great! But the disrespect for human rights directly contradicts it. That worries me. So yes, on one side it’s really great, lots of happiness, lot of people. I think it helps Brazilians have contact with people from other places and be all together, but I think we have priorities that should become necessities for our population: those who don't have health, food, etc. I love the Cup. I will participate in all the events, but I won’t stop thinking about the other side." *Simone asked to not be photographed.